Anyone who has seen my sporadic tweets recently will know that I’m sick at the moment. This has resulted in me feeling pretty sorry for myself, sleeping lots and generally whinging to anyone who will listen. That said, I’m not the kind of girl who is easily defeated so I’ve been hitting back at the virus with lots of homemade juices, Rosie’s Chicken Noodle Soup and long baths with a shot of Natural Hero Hot Ginger Muscle Soak to take the edge off of my aching limbs. I’ve been a huge fan of Natural Hero since day one and took both the Hot Ginger Muscle Rub and the Cool Peppermint Muscle Spritz with me when I hit the slopes back in January (review here) so you can imagine how excited I was when I heard Louise was adding the Hot Ginger Muscle Soak to her range. The only thing that stopped me reviewing it as soon as it arrived was the fact that I’m not a big fan of baths and often shower as soon as I’m done working out, which gave me very few opportunities to put the muscle soak through its paces. Fortunately as soon as I’m sick I become a complete bath hog which has given me the perfect chance to rest my weary limbs and try out the Hot Ginger Muscle Soak. Before my Muscle Soak arrived I had assumed it would come in one big bottle, not dissimilar to the sort bubble bath would come in, however when it arrived I discovered it actually came in six 18ml bottles. I’m not really sure how I feel about this. On the one hand this makes them super handy for travelling with, they’d be ideal for taking with you during a ski or surf trip for example, but on the other hand the added packaging doesn’t make them very friendly for the environment. 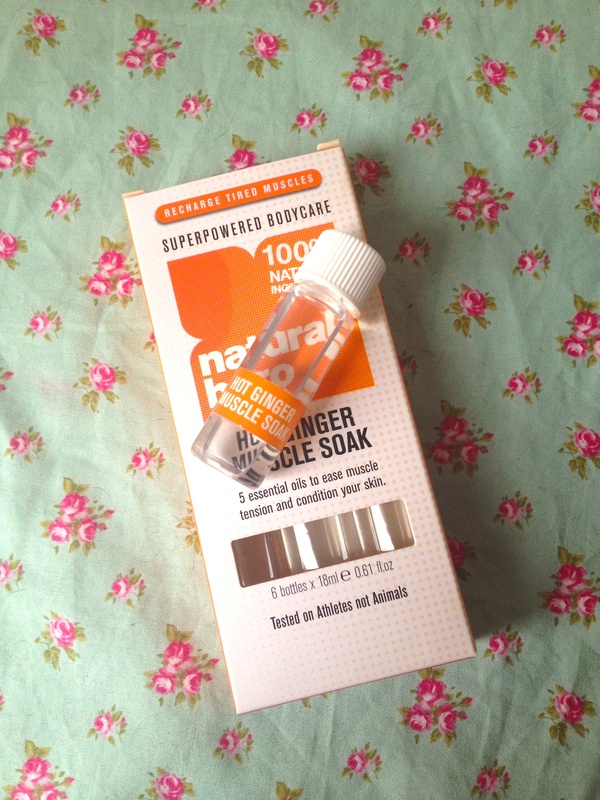 To use you simply pour one of the little bottles into a running bath and then lie back and relax. It has the same herbal scent of the Hot Ginger Muscle Rub, a pleasant, non-intrusive scent that helps to relax your senses without being over-powering. In fact after around 15 minutes in the bath I could barely smell it, though this may have been more to do with my bunged up nose and less to do with the soak! The bath oil isn’t the sort to lather up, but you can tell that something has been added to your bath water enough so that I would recommend this as the ideal addition to a relaxing bath where you just lie back and soak, rather than trying to wash and condition your hair in it as I found the oil hard to shift from my hair and ended up grabbing the shower head to give myself a final rinse. 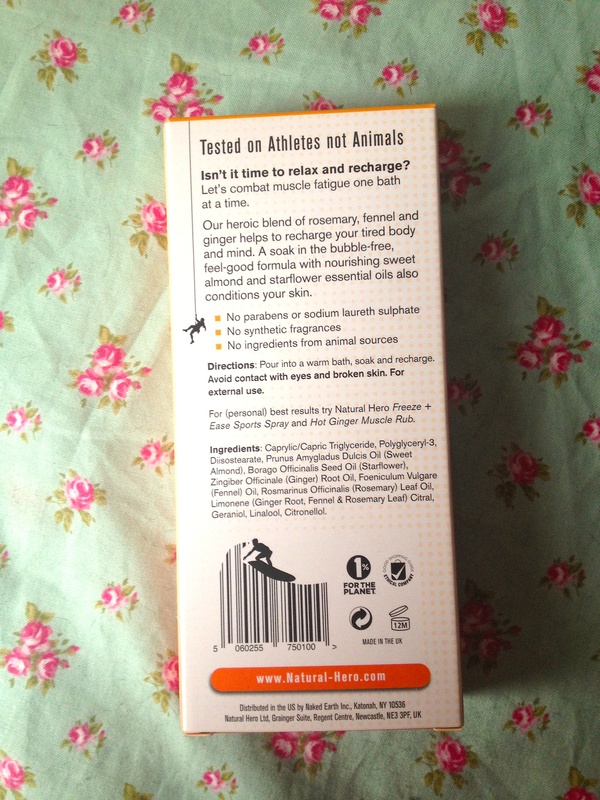 All in all, I found the muscle soak really effective at easing my aches and pains though I would love the option to buy this in a larger bottle for keeping in the bathroom when I’m not off on an outdoor jaunt. 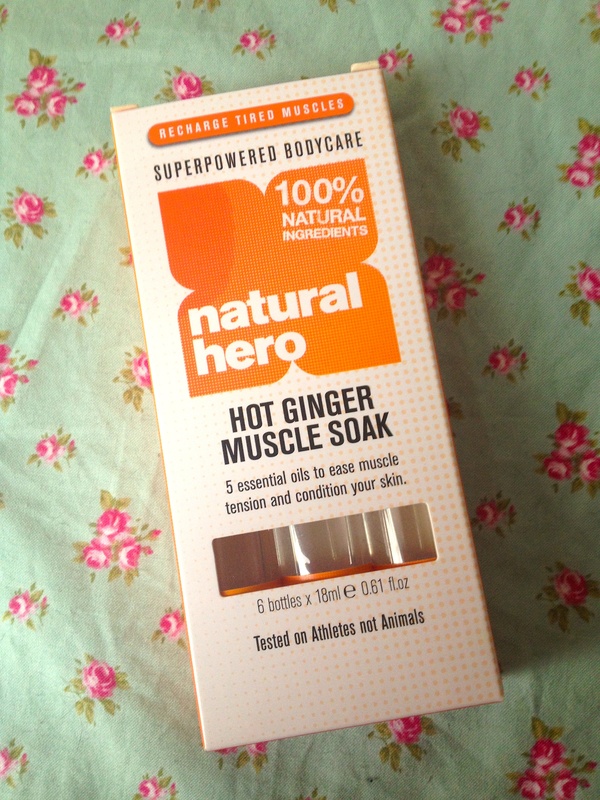 If you want to try Hot Ginger Muscle Soak you can buy it from Natural Hero for £9.99.